Important Note: Most of the files and folders described here are maintained by the Processor Expert Component Wizard. All the files (with the exception of icon/bitmap files) are text or XML files, so you can use any text editor to inspect (and change!) them. But make sure that you have backups or things in a version control system. If you screw up, you probably will screw up badly. The information I give in my blog are as good and as best I can, but there is no guarantee. Just to make sure you are warned ;-). I have imported a Processor Expert user component with the CodeWarrior menu Processor Expert > Import Package, but where are all the file(s) now? I cannot count on these folder names: they can change if I install a service pack which comes with a new version (number) of Processor Expert. The consequence of this is that even if all my user components are compatible, I need to have them in separate folders on my host. Tip: the only suitable workaround for this ‘Processor Expert version folder structure’ is using a version control system like SVN. Developing and testing/using Processor Expert user components without a version control system easily ends up in a desaster. Tip: Because it is hard to remember that folder location, I have created a shortcut on my desktop (or as a ‘Library folder’ in Windows 7). 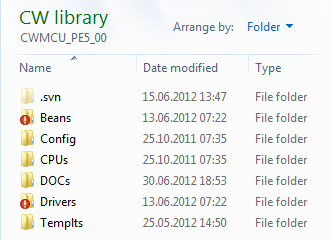 Users of SVN will notice the two red folder icons for ‘Beans’ and ‘Drivers’ folders: I have these folders under version control as the important stuff in these two folders. More on this follows below. Note: there is as well the ‘Templts’ folder which has Processor Expert User Templates. See Copy my Component Settings: Processor Expert Templates. 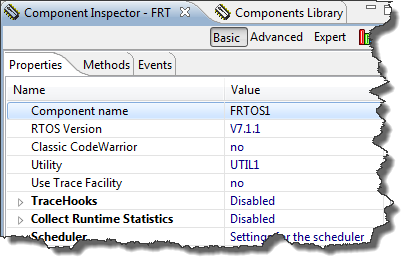 Components can have ‘private’ or ‘local’ interfaces. I use ‘global’ interfaces for ‘classic’ Processor Expert as otherwise I ended up with creating duplicated components in the project (one for each (local) interface). The solution was to assign a ‘global’ interface instead. The Eclipse version of Processor Expert has removed that limitation, but I keep the global interfaces for backward compatibility. This post explains special settings in the *.bean file for RTOS components. *.bean0, *.bean1 etc are backup files of the *.bean file. *.bmp: Binary bitmap and source of the icon for the component. See CDE Hacking: Component Icon. *.chg are CHG (Change) script files, executed when the user (or Processor Expert) changes a property. *.html are HTML help files. *.rtos is an XML file used as RTOS Adapter to describe such as memory allocation using an RTOS. *.tps are XML files describing User Types and Globals which are used in properties. *.uis is a normal text file listing all interfaces used. *.ust are XML files describing User Property Types which are used in properties. *.dev is an XML file with a template for the component/interface. Templates are the ‘default’ settings of properties which are used at component creation time. *.int is an XML file describing an interface between component. Interfaces describe the name and parameters of methods and events. Note: Additionally I can add my own files (e.g. text files) to the folder. If I export the component, all the extra files will be exported too. Apart of this, these files are not under Component Wizard control. The Common Folder contains *.inc include files which are included in the driver as ‘function’ header. See CDE Hacking: *.inc Files for more information. The sw folder contains the driver file(s): they are used to generate the code. It is possible that a component uses its custom folders. I recommend this for components which copy files or using a more complex structure. 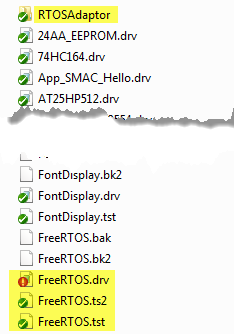 For this I maintain the RTOS files for example in the ‘Drivers\freeRTOS‘ folder. 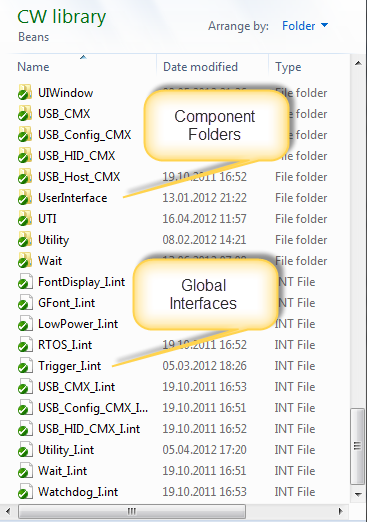 Such folders are not under Component Wizard control. It is possible that the component is using its own files to include other files. I’m using *.prg files to include other files. These files are not under Component Wizard control. *.tst: test script file which is used to do consistency checks for component properties. It is important to know the structure and purpose of all the different files. Yes, there are many, and they are important and interlocked. But after a while things get clear and easy to handle. The preferred way to manipulate the files is using the Component Wizard, but with the knowledge of this post there should be an easy start to understand the things behind Processor Expert components. This entry was posted in CDE, CodeWarrior, Embedded Components, Processor Expert, Tips & Tricks and tagged CDE, CodeWarrior, Embedded Component, Processor Expert, Tips&Tricks by Erich Styger. Bookmark the permalink. I can find any where to fit my question about the bean 24AA_EEPROMW, so I question here, may be have some related to. I look at in the code generated by PE, like method EE241_WriteByte(), at the end of method, it will call I2C2_SendStop(), but I connect the EE24 with bean of InternalI2C, it don’t have SendStop, but can “AutoStop”. so I have to changing the code of “24AA_EEPROM.drv”, and make a new property name “CanAutoStopOfI2C” to adapt to InternalI2C. this change can suit for my application. I’m checking the source how to fixed it by now. not sure what the source of this problem is, but it seems that the IAR compiler does not like the macro with the device address. Now that makes it clear. ANSI does not allow 0b for binary data, and not every compiler allows this. I have this changed in the component to use the hex constant. what problem with SendStop()? Maybe you need to disable ‘send stop automatically’ in the settings? in the InternalI2C component, you need to set the ‘Automatic stop condition’ setting to ‘no’. Then SendStop() method is availble. Have you tried this? Yes, it’s my mistake, I don’t know why PE component Inspector be changed to Basic mode. Sorry about that. I have make some change for I2C2_SendStop(), should I email 24AA_EEPROM.drv to you?